Egames have drawn attention in adult education, particularly as the majority of adults play egames. Adult education is increasingly incorporating serious games, mainly simulation games, but other forms such as RPGs are being considered. In addition, adult education is also incorporating game design into curricula. In terms of learning theory, gaming as a learning mechanism is usually associated with activity theory. Many commercial off-the-shelf (COTS) game combine solid content and concept along with good game play that engages adult learners. The gaming industry has increased focus on developing games for mobile instruments, mainly smart phones. Specific applications of egames for engineering education are discussed. Recreational aspects of gaming impact educational us of egames. 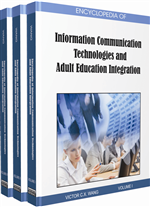 Future trends of adult education use of egames are noted: platform, workplace gaming, and industry development. At this point, egames have substantially penetrated U. S. households. For console games alone, 71 percent of households with boys or girls owned video consoles, and 80 percent of households with teenagers owned consoles (Neilsen, 2007). The majority of adults play video and computer games, and about a fifth of them play daily, usually on computers, according to a 2008 study (Lenhart, Jones, & Macgill, 2008). The researchers also found that gaming decreases with age (the average age of the RPG player is 26 years old), but senior citizen gamers play the most often because they have more free time. About 55 percent of gamers are male, and the percentage of urban players slightly outnumbers suburban and rural players. Gamers generally have more education and are more likely to be parents, but no significant difference was found for ethnicity or socio-economic status. Today’s college student is likely to have played computer and video games, and increasingly role-playing games (RPG). According to the Pew Internet and American Life Project survey (Jones, 2003), these games have become an integral part of college daily life. One-fifth of those surveyed stated that gaming helped students make and keep friends, and that it comprises part of a larger multitasking environment. These students see gaming as a break from studying, another form of entertainment. These students are also seeking college majors in gaming so they can get paid for what they like to do recreationally (Farmer, 2005). Increasingly, universities are offering such programs, particularly in light of industry demand for such trained employees. Role-Playing Games (RPG): Games in which the participants assume the roles of characters. Virtual Worlds: Computer-based simulated environments where users interact via avatars. Gamer: Devoted player of electronic games. Activity Theory: A theory that posits a relationship between a subject (person) and an object, with mediational means. Casual Games: Video or online games that are targeted to mass audiences. Immersive Education: Education that involves all the senses within a total submersion within the learning environment. Simulations: Representation of the operation or features of one process or system through the use of another. Mobile Learning (m-learning): Learning that incorporates mobile devices such as cell phones and personal digital assistants. Egames: Electronic games (video, computer, console). Serious Games: Games designed for a primary purpose other than entertainment.